Work in continuous rounds, use stitch marker to keep track of where you are. Fasten off, leave long tail for sewing, stuff. Fasten off, weave in loose ends. Stuff and sew to head. Through the frontloops of round 7 of the body. Start with sl st. *ch 3, sc in next st* repeat around . Fasten off, weave in loose ends. R2: start with sc in 2nd ch from hook, sc 6, repeat on the other side of the chain, sc 6. R3: sc 5, 2 dc in 1 st, sc 5, 2dc in 1 st.
Fasten off, leave long tail for sewing, sew to body. Fasten off, secure to head. Take a piece of yarn and split. Now pull a loop through the front of the hair and pull the ends through the loop. Fasten off, stuff a little and sew to back of the head. Take 2 pieces of split yarn and tie around the bib. OMGoodness, I think I'm in love! How darling is this!?! 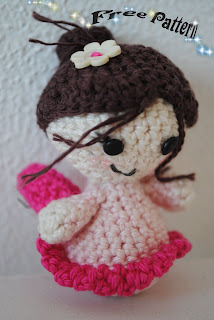 Thank you so much for sharing the pattern for this little sweetie! i must make her! too adorable! thank you renske for sharing the pattern for free..
Hi! my name´s MARA, I´m learning (amigurumis), and it´s very special for me to find free patterns for practicing. I´ve just follow your blog. I invite to my blog. Thank you so much for share the patterns. I've just made my fairy and I'm totally in love with her! Thank you all very much for your sweet words! If anyone has pictures from their fairy please feel free to email them to me! Thanks for sharing (: I'm sure that this will be a cutie once I finish it. Btw, when you say triple crochet, do you mean treble? I think that's what you're saying but I wanted to make sure x: Anyway, thanks again! oh yes I mean treble. Is that how you say it in english? hihi not my own language he? Treble is what we call it in the US x: Ah, lovely language differences. I once came across a pattern that used UK terms. Needless to say, I messed up. :3 Anyway, thanks yet again. oh, gotta make this one for my little girls! My big girl wants the ninja...I heart your patterns! Thank you for sharing your gift! Hi I'm just a beginner, please would you tell me what size crochet needle to use? I just love it and can't wait to make one! Hi I'm Beatriz and I'm trying to make your little fairy. would you mind to tell me what is the size for the safety eyes,please. so i can order them online, thanks and nice job!! I've just finished a little fairy. Thanks for the instructions! It came out great! Wat een schatje! Die moet ik gaan maken. Dank je voor dit geweldige patroon! Are you allowing people to sell your items online now? what size of crochet hook did u used? I have just completed my first ever amgurumi project. What fun and the pattern was so easy to follow. Thank you so much! I have a feeling I will be making a fairy for all my daughters now. I can't wait to get started! This is probably one of the cutest patterns I have seen in a while! Thank you for sharing I'm going to start one right away for my daughter! Thanks a lot for sharing that Pattern! You can find me on ravelry!! Look at what my friend made!